What’s better than a 240,000-square-foot shipping container mall? How about a 240,000-square-foot shipping container mall topped with a 13,399-square-foot rooftop park? YoungWoo & Associates and RXR Realty recently revealed the latest plans for their SuperPier project‘s green roof and it looks like the new green space will be even bigger and better than originally proposed. The 1.8-acre SuperPier park plan now includes a total of 13,399 square feet of greenery, which is over 3,000 square feet more than in the original design. Planning a park like this is no simple task. 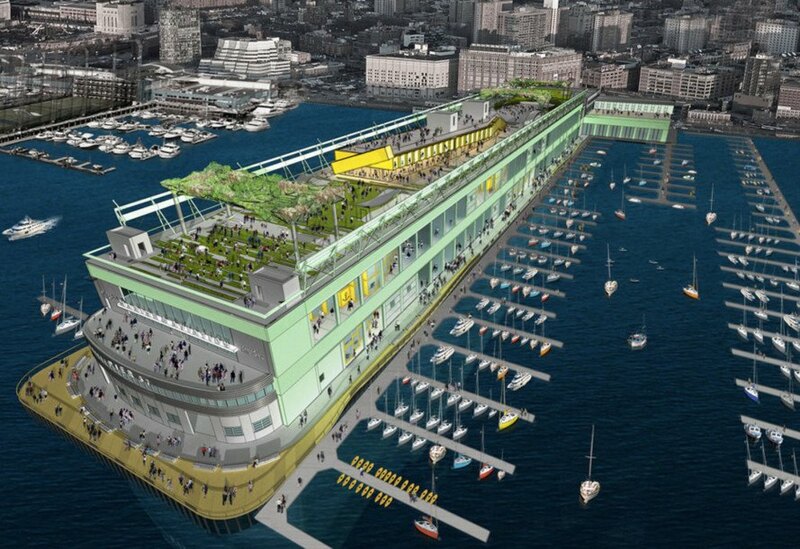 Because of Pier 57’s designation as a “historic pier,” there can be no trees on the roof or shade structures and green showing from certain angles. Designers got around this by using large planter islands, which double as seating, as well as living green walls. These features replace the standard sod you’d see at a ground-level park. The plan calls for three different plants—Fallopia, Clematis and Hydrangea—which were selected strategically because they bloom at different times of year, so the colors and appearance of the park will change through the seasons. In the absence of shade trees, large sail-like shades controlled by park officials will shelter parkgoers from the sun, while other mini-shades will allow visitors to take a load off at cool, covered spots at one of 60 concrete seating structures. Creating a movable, customizable design is what helped RXR Reality subvert the restrictions related to shade structures. The park is designed to accommodate up to 2,600 people for relaxation as well as community events. The design still has to pass through several approval phases before construction begins. Next up is a public hearing in the fall with a 60-day comment period, to be held by Hudson River Park Trust.